This is a great spring, summer and fall hike that parallels the creek most of the way. The trail departs and immediately begins a steep climb for about 1/4 mile ,the trail then splits left for the Deluge creek trail or continue right for the Gore Creek trail and a sign for the Eagles Nest wilderness area. Beyond this sign you may disperse camp but keep in mind to set up camp at least 150ft from any creek, lake or water source. From here on the trail levels out and parallels the creek with great views of the Gore Range and sometimes great views back South towards East Vail. 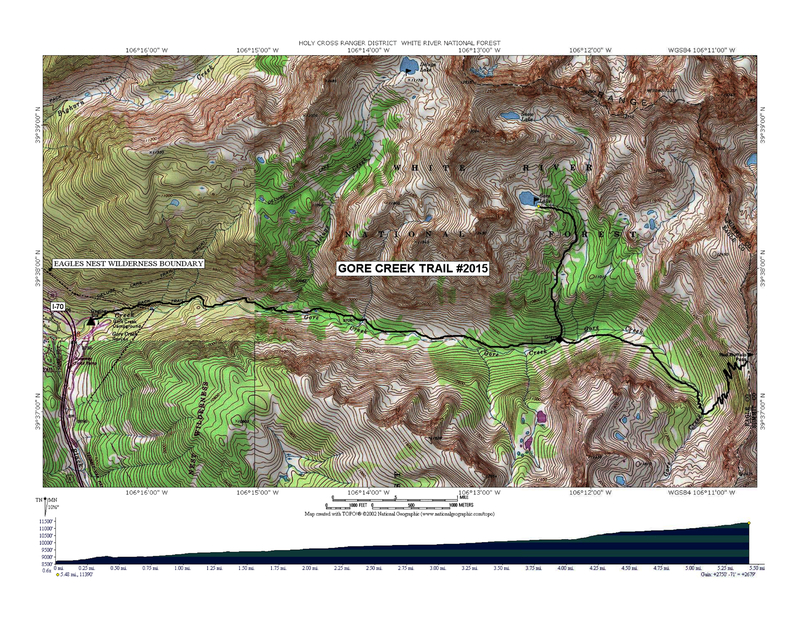 At about 4.2 miles there is a turnoff to start hiking up a steep gulch to Gore Lake or you can continue on to link up with the CDT at Red Buffalo pass or Eccles Pass. If you continue up to Red Buffalo Pass you can expect an abundance of wildflowers during spring time. As always take only pictures and leave only foot prints, remember LNT principles. Creek campground. Parking is limited. Please park at the trailhead, not at the campground. forest into the alpine tundra to Gore Lake. The trail is steeper in this section. Driving East or West on I-70 take the East Vail exit and continue driving East on Bighorn Rd till it passes under I-70 and the trailhead parking will be on your left.